Gerald Scarfe, renowned British artist and caricaturist has lent his name and artistic vision to Scarfes Bar where his completed artwork has now been revealed. Gerald’s collection of amusing and conversation-provoking paintings, highlighting his best work, adorn the marble walls turning Scarfes Bar into a living canvas, described by Gerald as his personal art gallery. Gerald’s collection of original and one-off paintings, now a permanent feature in the bar, add a unique twist and depict well-known historical and famous faces recounting the colorful history of the United Kingdom in Gerald’s witty and satirical. 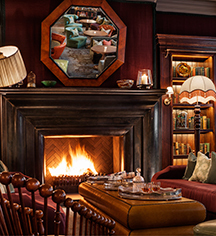 Inspired by the atmosphere of a drawing room and the sophistication of a gentleman’s club, Scarfes Bar features a roaring fire, a collection of cozy velvet armchairs and shelves filled with over 1,000 antique books hand-picked by a Portobello antique dealer. A creative menu of cocktails and complimentary live music six nights a week all add to the conviviality and certainly give true meaning to the phrase ‘get scarfed’ at Gerald’s eponymous bar where potions and paintings meet. The bartenders are true connoisseurs of their craft from advising on beers and matching wines to preparing specially-curated cocktails, some of which are poured from a stunning silver urn that takes center stage on the long wooden bar. 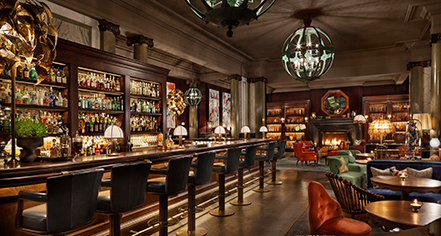 With over 200 single malts and a rare specialization in sloe gin, including the hotel’s own label of the supremely British spirit, Scarfes Bar is a must-visit in the heart of Holborn. Contemporary bar snacks available all day and night.